Our process grounding is centered around the Agile Scrum Methodology. We follow a lean process with several iterations and daily progress monitoring carried out by empowered team members. This helps in enhancing the quality of deliverables and also adhering to timelines. Ruby Software strives to provide the following benefits to its valued customers by adopting this methodology. In Agile development, testing is integrated during the cycle, thereby ensuring regular checks on the quality of application during development. Because of the shorter milestones, there is tighter control on the execution of the tasks, doing away with time-consuming processes. Customers prefer rolling out a minimum viable product (MVP) first and then scaling up to larger models. 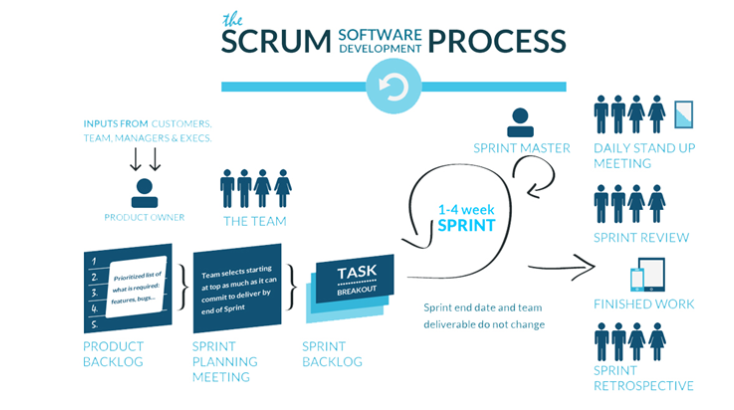 Agile process is aligned with that philosophy.The projects are executed in several sprints, each of typically two weeks duration. An Agile approach provides a unique opportunity for clients to be involved throughout the project, from prioritizing features to iteration planning and review sessions to frequent software builds containing new features. The iterative approach allows for constantly refining and reprioritizing the overall product backlog. New items can be planned for the next iteration, providing the opportunity to introduce changes in a short time.